Professor McCrory received his BSc in physics from the Massachusetts Institute of Technology (1968) and his PhD in applied plasma physics also from the Massachusetts Institute of Technology (1973). After positions as Research Associate in the Department of Nuclear Engineering at the Massachusetts Institute of Technology, an Alfred P. Sloan Fellowship, and as Staff Member in the Theoretical Division at the Los Alamos Scientific Laboratory, he joined the University as Scientist and Coleader of the Theory and Computation Group at the Laboratory for Laser Energetics (LLE) in 1976. He has been promoted several times and currently serves as Director, Chief Executive Officer, and Senior Scientist at the LLE. He was appointed Vice Provost in February, 2006. He became Professor of Mechanical Engineering in 1984 and Professor of Physics in 1999. Professor McCrory was appointed Executive Director of Governmental Relations for the University of Rochester in 1997, a position he held until 2004. 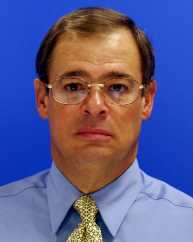 McCrory serves as Associate Editor, Physics of Plasmas; and has served as an Associate Editor for Laser and Particle Beams and as a member of the Editorial Board of Nuclear Fusion. He was elected a Fellow of the American Physical Society in 1985, and received the Edward Teller Award in 1995. Professor McCrory research interests are in the general field of Theoretical Plasma and Laser Physics. He has made numerous contributions to inertial fusion beginning with his work on wavelength dependence of the hydrodynamic efficiency of laser-driven targets and hydrodynamic stability theory. He was awarded the 1995 Edward Teller Medal for his pioneering research and leadership in the use of lasers for controlled thermonuclear fusion. The Fusion Power Associates Board of Directors awarded him the 1996 Leadership Award for his outstanding leadership qualities in accelerating the development of fusion. The Board noted the key role he plays in the management councils of the national and international inertial confinement fusion communities and his important role in bringing an academic perspective to the national inertial confinement fusion program. He was elected a Fellow of the American Physical Society in 1985 for his many contributions to fundamental understanding of hydrodynamic instability and thermal transport in laser-driven plasmas. He served on the National Academy of Sciences' Committee on Space Technology to the US Space Command of the Air Force Studies Board which advised the U.S. CINC SPACE on the military use of space, space architecture, and space policy.